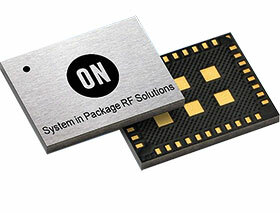 ON Semiconductor’s AX-SIP-SFEU is a programmable RF transceiver system-in-package (SiP) integrating an advanced RF system-on-chip (SoC) with all surrounding bill of materials (including a TCXO). The device provides a highly integrated Sigfox solution for both uplink (transmit) and downlink (receive) communications. With the challenging space constraints of many IoT (Internet of Things) applications – where, for example, connectivity is needed close to the sensor – the 7 x 9 x 1 mm SiP transceiver has a miniature footprint and is smaller than a module-based solution. Due to the need for long-life from a battery powered solution, a further concern for design engineers working on wireless communications applications is power consumption. Sigfox’s predictable and claimed lowest energy consumption ‘device-to-cloud’, is complemented by ON Semiconductor’s own ultra-low power design to give the SiP standby, sleep and deep sleep mode currents of just 0,5 mA, 1,3 μA and 100 nA, respectively. The AX-SIP-SFEU connects to the customer’s product via a simple universal asynchronous receiver transmitter (UART) interface. AT commands are used to send frames and configure radio parameters, with an application programming interface (API) variant available for customers wishing to write their own software. The device is delivered with conformal shielding and pre-certified radio regulatory approvals.